The AVN-MPTR Technician Remote Unit allows a technician to have control of a Virtual Mixer, paralleling the Presenter Remote Unit controls. The MPTRs are assigned to a gallery and hence are normally tied to a Mix Engine. 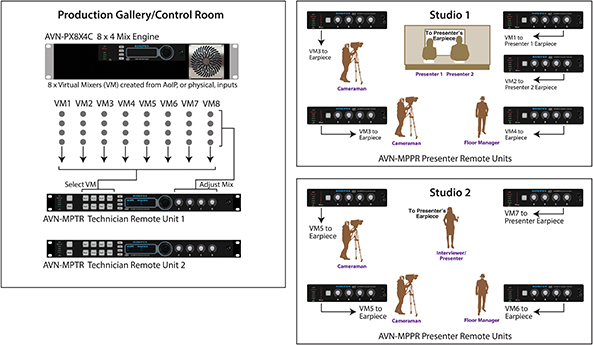 Note that no audio is present on the Technician’s Remote Unit – the monitor audio for this is provided by an output on the Mix Engine routed to the technician’s area, but this product has similar connectivity to the MPPR and we can supply audio enabled versions of the MPTR if required. The Virtual Mixer (VM) to be controlled is selectable using the Virtual Mixer buttons labelled Pres 1 – Pres 8 on the front panel. The mixer selection buttons are only active when the AVN-MPTR is grabbed by a mix engine (as indicated by a green Auth LED). When a VM is selected, the corresponding button will be illuminated green (or blue if MPPR lock out is set for that VM). If no VM is selected, then all the mixer select button LEDs will be off. Once a VM has been selected, the rotary encoders act in the same way as on the Presenter Unit. The AVN-MPTR is able stop MPPRs that are assigned to a particular VM from controlling the source levels. 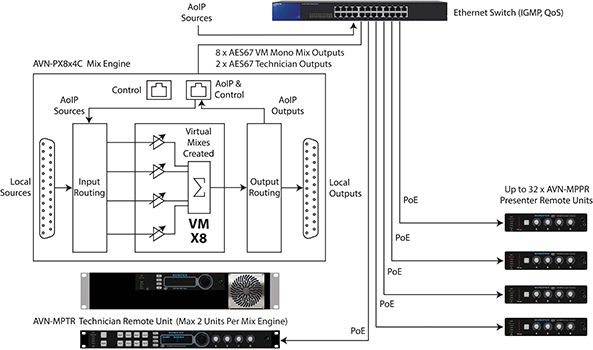 Product Function: Allows selection of each of 8 VMs and remote adjustment of volume controls. 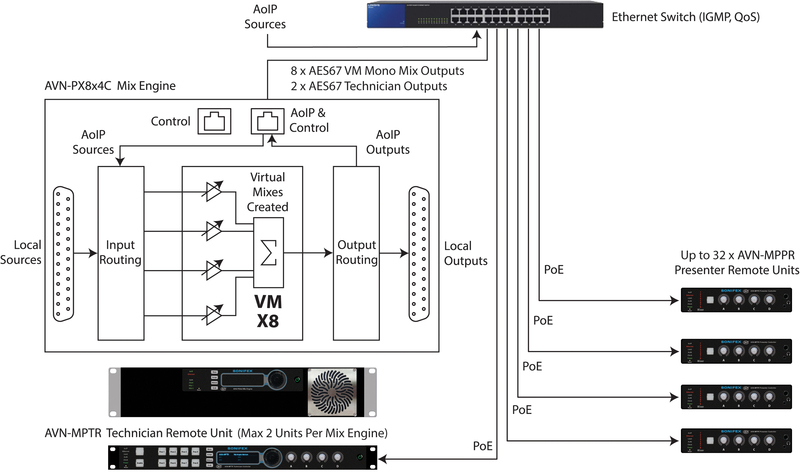 Allows selection of each of 8 VMs and remote adjustment of volume controls. 8 virtual mixer select buttons. 4 x rotary encoders showing input level metering and output volume control. GPO enable and activation buttons. 1Gb PoE Ethernet and power using Neutrik Ethercon.